There's a new champion in eSports, but Korea retains the crown. There’s a new Champion in eSports. Kim ‘sOs’ Yoo Jin is the greatest StarCraft II player in the world. Entering the World Championship Series Finals event at BlizzCon as the 12th seed, Protoss player ‘sOs’ defeated one StarCraft II superstar after another, including top-ranked Choi ‘Bomber’ Ji Sung, Song ‘HerO’ Hyeon Deok, and Choi ‘Polt’ Seong Hoon. Yoo Jin’s path of destruction led to a climactic best-of-seven showdown against legendary StarCraft II veteran Lee ‘Jaedong’ Jae Dong. After taking two quick games to open the series and narrowly losing a third, the unlikely champion claimed a decisive 4-1 victory, and hoisted the Gosu Trophy. 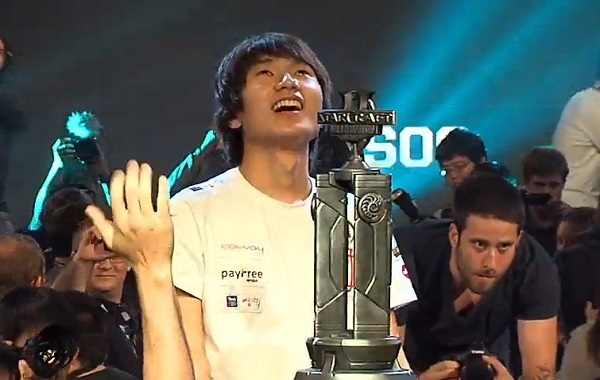 The crowning of the world’s best StarCraft II player took place amidst a sold out BlizzCon. More than 25,000 gamers from around the world came to the Anaheim Convention Center on November 8-9 to be a part of BlizzCon 2013, Blizzard Entertainment’s two-day gaming festival. Members of the global gaming community tuned in from around the world to watch all of BlizzCon’s exciting eSports action. Events included the 3v3 World of Warcraft Arena Global Invitational, with the top prize going to North American team Skill-Capped, and the Hearthstone Innkeeper’s Invitational tournament, won by renowned eSports caster Artosis.